Not knowing where you want the journey to end guarantees you won’t end in the right place. When you want to arrive is almost as important and where you want to arrive. The end result is usually bigger than “just” CRM (consider all the relationships which need management). Be clear about which business capabilities need to be supported or enhanced with Salesforce. Don’t transfer fractures in organisational structure into Salesforce – share common customer data. Stay abreast of Salesforce’s own roadmap. Define strategy (the “why”) and required business outcomes (the “what”) before considering the “how”. The “what” has to be measurable as this defines success. Having key stakeholders including operational managers express and approve requirements is critical. Don’t leave thinking about reporting/analytics until last. Consider security upfront – both who can see what data and who can perform what functions. Multiple projects at once are hard to coordinate especially when multiple delivery partners are utilised. Doing two different things at once is three times harder than doing one thing at a time. Doing two different things fast at the same time is four times harder. Running multiple overlapped software development projects will increase the need for tight governance (processes and tools) to manage requests for change, development, testing and deployment. Waterfall (all requirements up front), Agile (requirements clarified one short iteration at a time) or Fragile (requirements clarified through repeated experimentation). Agile does not mean being continuously vague and discovering requirements by endlessly building the wrong thing then fixing it. If you are not sure what you want or how to build it explore options using discardable prototypes. Use an internal self-managed agile team if your organisation has adequate software delivery maturity and available resources. Otherwise use an internal partner-managed agile team in preference to using an external remote partner delivering under a waterfall driven statement of work. Consider what the team needs to look like when you are finished and the delivery partners leave. Work towards that outcome throughout the project so those responsible for operational management have experience with the implementation details. Data quality will degrade without proactive steps to maintain it. Implement the platform’s tools to minimise duplicate customer data. Use validation rules to enforce a base level of data quality. Calculate a data quality score for key objects and use dashboards to drive behaviour. Don’t add data fields to objects unless there is a strategy to populate them. Make sure the relationships added between objects are done by someone capable select optimally between master-detail, required lookups and filtered lookups. Consider reporting and query/report performance early. Index text/picklist fields which are important for reporting by flagging them as an external ID. Ask Salesforce to add custom indexes to custom date fields if they are important data selection filters. Develop a testing strategy and direct delivery partners as to what testing you require them to complete. Testing has to address the outcomes desired as well as the outcomes to be avoided. Recognise Salesforce’s 75% code coverage rule does not necessarily deliver automated tests which usefully determine if the system is working as it should. Software engineers usually make poor testers so resource the testing function appropriately. Documentation needs to capture how the system works and how it integrates to other systems. Projects should provide documentation which explains what changed (and why) as well as how to reverse a deployment which causes problems. Keep information about system architecture current (what systems different user roles interact with and how systems integrate with each other). There are many ways to achieve the same thing in Salesforce and use a coded solution last. Don’t custom code a user interface until you have tried the auto-generated user interface. The composition of the optimal operational team varies depending on the size and complexity of the implementation. Include a developer in the team if they are expected to maintain custom code (vs custom configuration). Budget for ongoing training and incentivise team members to achieve and maintain current certifications. Use Salesforce Trailhead for self-paced learning which is both fun and easily measurable. Leverage operational assistance sourced from Salesforce Premier Support and Salesforce Partners. Define what KPIs matter and measure them. Ask executives to lead by example by being visibly active in Salesforce. Use Salesforce’s Chatter, Ideas, Q&A, and Portal functionality to keep the conversation alive. When does Social CRM become a form of commercial stalking? Social connections quickly become overwhelming, if not creepy, once personal links surface too often from unexpected directions. My mother made a similar comment this week, asking why Facebook persisted in asking her to “friend” people she does not know, or knows only remotely through third parties. She asked why Facebook does not “get” these suggestions are not valued and persists in sending them to her. My teenage daughter says her friends are also turning away from Facebook for similar reasons. Facebook has become “in your face” and therefore an annoyance. Digital consumers are savvy enough to realise the only reason Facebook has any value at all is because they use the site. In that sense they are working for zero wages. Users of free platforms like Facebook can leave far more quickly than they arrived. As the utility of the platform decreases and frustration increases a tipping point will get crossed – after all “delete my account” is only one click away. Social CRM in a commercial sense worries me in a similar way. I understand the value in being informed before making a sales call, and in being genuinely interested in a customer beyond their value as a purchaser of products. However there is a fine line between subtle preparation before a sales call and commercial stalking. The rule defining this fine line is not written down but it is a under the control of your customers. Once your customers say “stop stalking me” Social CRM becomes an impediment to success rather than an aid to effective selling. An Irish musician said this to me once. It was in the context of Irish folk music performance, but it applies equally to business. So why is it that business so often fails to foster active engagement with their customers? I typically get asked to work with clients who want to deploy a CRM system to manage customer relationships. But so often all this means is they want to a tool to throw to the sales and marketing people to help them keep track of who is talking to who. Problematical already given most direct and indirect sales teams who are incentivised through commission don't want to share any information. Business processes are not purely internal within commercial organisations; they are tightly coupled to the ebb and flow of customer interactions. Deploying CRM without any attempt to actively engage with customers usually fails to deliver truly valuable business objectives. The goal should be to deliver a tool to foster a healthy active life cycle that includes the customer as the most important element. Social CRM helps, but that can just be a tool for a traditional sales team to listen and not to engage. The musician equivalent of businesses that face inwards and neither listens or engages with their customers is like a pianist who never looks up and never listens. And whilst listening might help you hear the cheers or the boos, it won't by itself make start a conversation or establish a community. Before the cheers or boos become audible there is so much to learn through engagement. Is your audience actively listening and watching? Have they turned their backs on you and are pretending you are not there? Arms cross looking dissatisfied? Or worse, walking out? That is why "Salesforce" is such a poor brand for the Salesforce.com platform. It positions the platform as a tool to help the sales team. Which I guess is where it all started, but the world has moved on. Certainly customers have. I prefer to rebrand any CRM installation I work on as a platform for engagement. Sure there are components to increase demand and better process qualified leads. Sure there are components to more efficiently process customer service requests. But you can do all that with your back to your audience and never actively engage eyeball to eyeball. Allowing customers to directly engage has to more than an initiative to improve efficiency. I see organisations moving in their understanding of engagement from sales and service support, to the point of "allowing" customers to directly enter data. The platform is seen as a tool to benefit "us", the busy performers facing the inside. However the next step is the key one, moving to the point of recognising the need to engage activity in conversation and community. That is where Salesforce functionality like Ideas and Answers becomes powerful, allowing customers to engage with each other and with the business. Through online portals that allow users to collaborate together and with the business, CRM moves from relationship management to a tool to foster community. The good news for organisations that just give CRM to the sales and marketing team for internal use, without listening and without engaging, is the best is yet to come. The real reward will come when like a musician the organisation faces the audience and engages, and then tailors their offering to what you see and hear! The Department of Innovation, Industry, Research and Development in the State of Victoria (Australia, see http://www.diird.vic.gov.au) is doing just this. They are deploying the Salesforce.com platform, but the Salesforce brand was fortunately abandoned early. They refer to the system as GEMS, the Global Engagement Management System, and it is designed to deliver better engagement not just better internal efficiency. FuseIT Australia (http://australia.fuseit.com) is pleased to be helping this forward looking government agency move into the world of cloud computing and stakeholder engagement. Does your organisation need help to face the audience and engage? 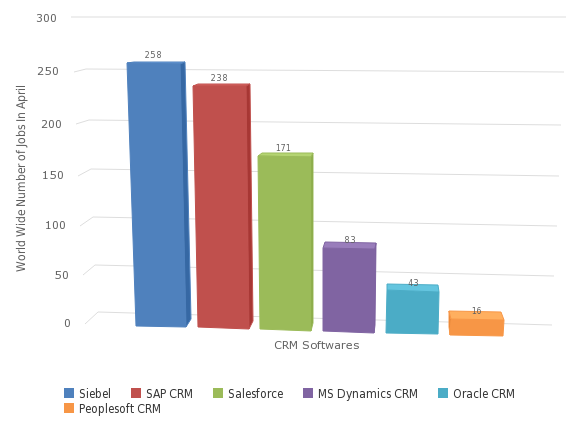 Which CRM system is most popular? Comparing job demand is an interesting measure. All software products have fluctuating popularity as user expectations and features change. So how do you work out which is the best if you want to back a product that has good momentum? Evaluating the job market to see which product is most popular within a category is one interesting approach. Check out http://jobgraphs.com/crm-softwares-demand-comparison/ with CRM products in mind. Monitoring the trend in the job market is a good way to spot the ebb and flow of popularity. Here we can see demand for Salesforce.com professionals increasing significantly between March and April. For those interested in CRM, watch out for the new kid on the block, Nimble will soon be lauched with a fresh take on Social CRM. You are currently browsing the archives for the CRM category.